This Fall Lil A got into ninjas, he started doing moves, and wanted to learn karate. That led us to enrolling him in a little Ninja karate class. While he was a little unsure in the beginning as the months have gone by, he has become more and more comfortable. Lil A enjoys wearing his uniform and going to his class. They do little karate, then play games and have a little chat. We've learned ninja dodge ball is a lot of fun and Tiny M likes it too. The little ninjas had a christmas party this week and that's where I discovered these cookies and of course had to try them immediately. 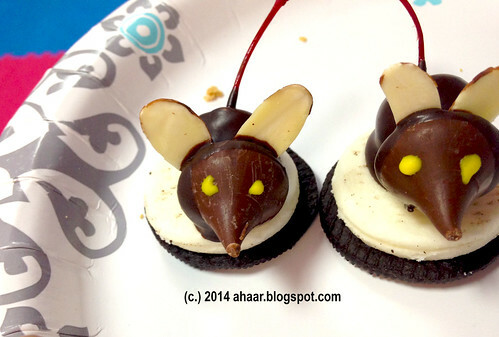 They are easy to make, no baking involved and kids and adults like it in equal measures. Sometimes I have these moments when using existing ingredients and making a delicious dinner works in tandem while entertaining. This was one of those times. And I have to say this. 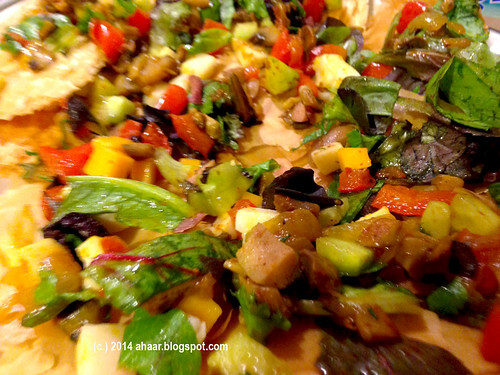 If you are thinking of making something to wow your guests, look no further than this phyllo dough vegetarian pizza. With a little prep time, this pizza comes together nicely and you can decide what topping goes on the phyllo dough. I used a mix of cheese, green, olives and roasted vegetables, but really the choices are endless. You can go with chicken, chickpeas, pesto with capers or any other combination you can dream of. 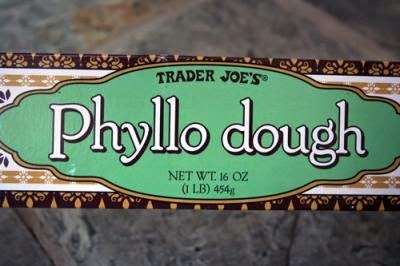 I had bought some phyllo dough from Trader Joe's and it had been sitting in the freezer for a couple of weeks. Then this pizza presented itself. It went well with a bowl of chicken stew. Take a baking pan and cover it with foil. Oil it nicely. Then take about 2 sheet of phyllo dough, brush it with oil and then layer it with another 2 layer of dough and continue till you finish the dough. Preheat the oven to 350 deg F and then bake the phyllo dough with 8-10 minutes. In the meantime, heat a pan with 2 tbspoon oil and add onions. Saute it for 3-4 minutes. As it browns, add the peppers and mushroom, add turmeric powder, cumin seed powder, black pepper and salt. Let it cook for another 3-4 minutes till the water released by mushrooms have dried. Combine greens, cheese, veggie mix, and olives together in a bowl. 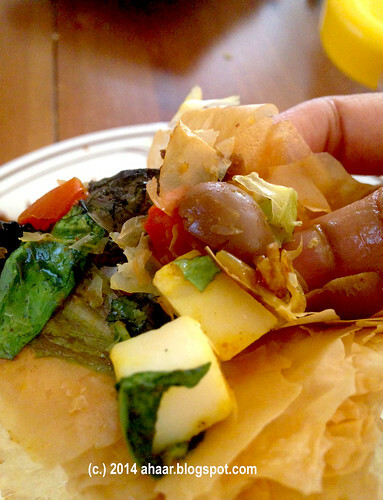 Cut the phyllo dough into serving pieces and then top it with the green, cheese veggie mix. Serve while warm. Tiny M is all about talking nowadays. I see him sometimes having a whole conversation by himself. Other times, he is trying to copy what we are saying and is so thrilled if he gets it right. He can now address his grandparents, his cousins and his aunt and uncle and it makes them so happy. His older brother was just "O" for the longest time till he became "amu". I am now "mama", "mummy" or "mum" depending on his mood and Aswin is of course baba. He learned "daddy" from a TV show recently and immediately implemented it. "Daniel Tiger's Neighborhood" on PBS is his favorite TV show and yesterday I saw him use his toy phone to call "ne ne" Daniel Tiger and talk, nod his head and say bye before putting the phone down. It also means he can now say "no" to a lot more things as well. Nap time- "no", pull up change- "no", eat your food- "no". In short, he's quickly becoming a an opinionated little person. I write this post as wind whips around the windows, the sun is hiding behind clouds, the white-powdering snow covers the ground and the temperatures are stuck in teens. It makes me craving yet another cup of hot tea. The winter is here and it's just mid-November. How are you warming up this winter? In the last couple of months, I have added a hobby to my packed home-work-home schedule and I have to say I'm enjoying it. It's pottery class. I go once a week and am enjoying the rhythm of it. This is one of the soap dish I made in the first month. I sat at the pottery wheel a month ago and have been trying to make some straight bowls, but it's hard. All in all, it has been fun learning a new craft. Hope it is not too late to wish everyone Happy Diwali. Hope you had a wonderful festive season with lots of joy, time with friends and family and delicious food. Lil A is has a Diwali celebration at school and since it will probably will be the only time he is celebrating it in school, he is quite excited. The teachers mentioned that there will be diya painting, mehendi, bollywood dancing and food. I have signed up to take rasgullas and mini idlis to share with his class, and will be sure to report back on the festivities that happen there. How is Fall weather treating you? What have you been cooking? Last post I talked about all the cleaning. This time let me tell you about all the cooking that has happened in the last two weeks. I have been trying to be good about packing lunch for work. A lot of times it is leftovers, but sometimes I get inspired. Just yesterday, I made quinoa, vegetable burgers and had it with cucumbers. 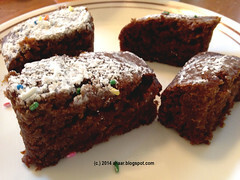 I have also been trying several blogger friends recipes that have been bookmarked for long. I recently made Manisha's Kadipatta chicken, and Sandeepa's date cake. Both came out great, thanks gals. 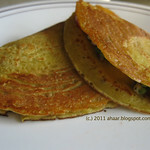 Nupur's zucchini dosa has become a staple in our house. We make it as long as zucchini's are available in farmer's market. There is a new harissa shop that has opened in Ann Arbor selling different varieties. We picked up a bottle and made Moroccan style chicken stew and it was delicious. It's Pujo season and that means there is a lot of activity - clothes to buy, getting ready, friends to meet, sweets to make and food stalls to try. To everyone who is celebrating, have a wonderful Durga Pujo and Shubho Bijoya. This season has been quiet for us this year. I don't have any sweets, but I have two sweet mango pickles to share. 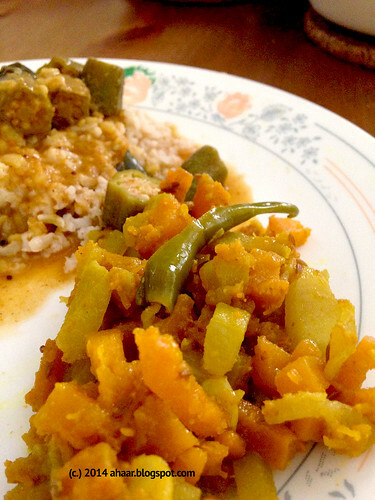 When I went to India, I ate copious amounts of the pickles and even helped make one of them. I brought a bottle of each back with me too. One of the recipe comes from my mom, and the other one comes from my SIL's grandmother. One is cooked with sugar and had a jammy texture. 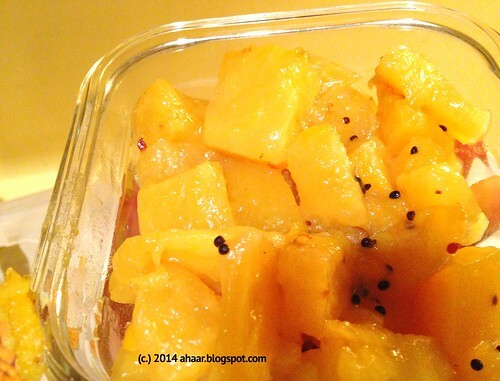 The other one is cooked with jaggery and spices and has soft long mango pieces. The process takes a couple of days - to dry the mango and then cook it in batches. But the result is fantastic. The kids love the sugar one and will eat it as jam. 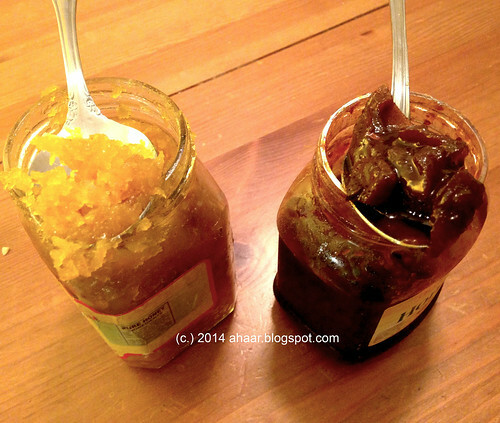 I love the gur/jaggery pickle. 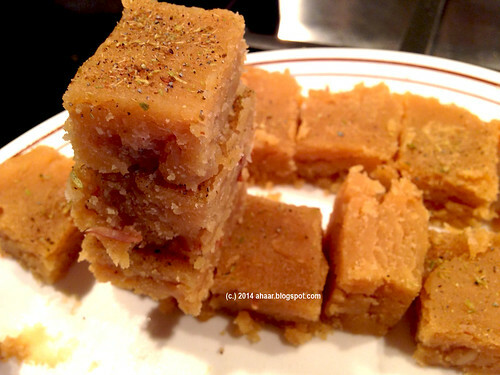 It satisfies my craving for sweet and spicy in one go and it is fantastic with some khichuri. Now that the mornings are cooler, I have been sorting kids clothes, adding some layering, full shirts and t-shirts and removing clothes that are too small and storing stuff that can be used next year. I had a lot of clothes to give away this time, mostly Tiny M's because he is suddenly a toddler and I have bags full of baby clothes. It took some time, but I had to sorted by months. They were then separated into many piles - going to india to MIL's neighbor, Aswin's cousin who will soon have a little baby, a colleague friend and donation. What do you do with the clothes that don't fit anymore? After coming back from India we have been at the Farmer's market and it is overflowing with so many fresh vegetables and fruits. I picked up cantaloupe, tomatoes, corn, radish, beetroots, eggplant and herbs this week. The tomatoes and corn came together nicely in a salad we had with tandoori chicken. The beetroots went into a pachadi and the greens were a quick stirfry. I am back with ABC of Bengali cuisine. Now, B can lead us to many crunchy Bengali food journeys with bhaja (fried) and beguni (dipped & fried eggplant). But I want to deviate to talk about simple comfort food that has been had in almost all Bengali households - bhaate sheddo. I love a good bhaja and had a good share of them while in India.This kumro bhaja with fresh kumro (pumpkin) was just divine and was perfect with a hot cup of chai after the rains. Bhaate sheddo literally means cooked with rice. It becomes a one pot meal where most commonly potatoes and sometimes even eggs are cooked with rice. Sometimes lentils like mushrir dal (masoor dal) will be put in a pouch and dropped in the boiling rice water to have some boiled lentils on the side. When the rice is cooked, the potatoes, eggs and the lentil pouch is separated. The potato and the eggs are mashed with oil, salt and green chilli. One can also add some chopped raw onions to the sheddo mix. My thakuma would burn or fry a red chilli and mash it in the alu sheddo. It tasted divine. Now thakuma had rice for breakfast, and lunch. Most of the times, her breakfast was bhaat aar sheddo. When me and my cousins were little we would sit around her during her breakfast time. She would make a little round ball of rice and sheddo and each of us would get a bite. This time when we were in India, a friend was coming to visit for lunch and we decided on ambode and kadhi for the lunch menu. Now, this is a dear friend from Ann Arbor and the kids were very excited to see a familiar friendly face, but were also confused and asked "Why are you in India?" Once they settled down, the boys had a lot of fun showing off their new toys, chota bheem t-shirts and had Bourbon chocolate biscuits together. We said bye to the friend with some sadness knowing we won't see him back in Ann Arbor when we are back. Coming back to the lunch menu, ambode is a mixed dal vada which can be made two ways - usually without onions. You can add onions then it becomes more like masala vada. You can also add curry leaves, or methi leaves to add a different taste. It makes its presence during festivals when ambode and kadhi is a popular combination followed by payasam. Hello friends! We are back from our India travels. It was a hectic month traveling with both kids to India for the first time. We spent time in Bangalore and Delhi for most parts. Then, we did little trips to Mysore and Rishikesh. It was a month of visiting friends, spending time with family and of course eating. Before we knew, a month had flown by and we are back in the US. 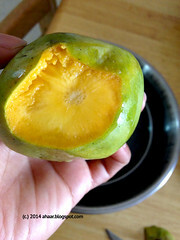 There is no doubt that one of the big highlights of the trip is that we got to eat Indian mangoes. Both the kids and us devoured all the different mangoes that were available. The choices were immense. There was langda, dusheri, chausa, banganpalli, sindoori and many little ones for which I cannot recollect the names. Oh it was just delicious! Sweet as sugar, the kids loved it. We probably had one if not more everyday! 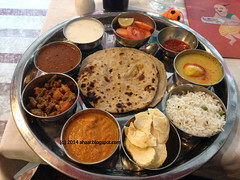 During our travel we also had a chance to savor local, traditional meals and thalis whether it was North Karnataka thali or a vegetarian thali at the famous "Chotiwala" restaurant in Rishikesh in Uttarakhand. There will be a separate post on my India travels. 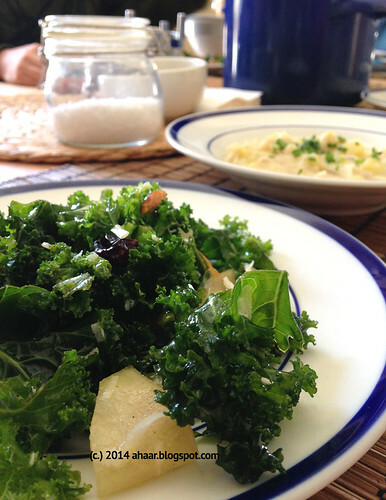 In this post I want to talk about all the good homemade food I ate. Delicious, simple, or complicated, they were made with so much love for us. Rice rava upma, mirchi ka salan, katla macher jhol, multigrain dosa, mishti aamer achar (sweet mango pickle) are just some of them. Does it happen to you that some week just turn out to be intense cooking week when creativity flows and everything seems to come together perfectly? It happened last week, weekend actually. It seemed like every meal we cooked had a new element or a new dish. We all took turns cooking as well so that worked well too. 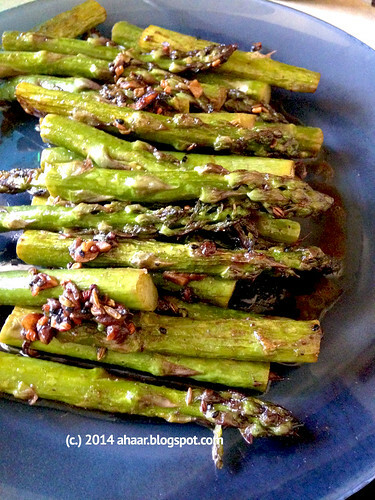 This asparagus was cooked during that time for a dinner with friends who were moving away. The combination of panch phoron, garlic and asparagus went so well together, I couldn't believe I hadn't made this before. In other summer news, we are getting ready for a big trip. We all are traveling to India. I have traveled with one of the boys at a time, but two together? Any tips on how to keep them occupied during the flight? How is your summer going? What are your plans? It's World Cup time! How many of you are watching the World Cup? Lil A was just born the last time World Cup came around. This time, he is kicking the football (yes I said football not soccer!) around. Mostly, the kicking happens in the backyard, but sometimes he sneaks the ball inside too. We have a long corridor and he will spend a lot of time playing there. But just yesterday he kicked the ball high in the living room and one of the vases knocked over. He was immediately contrite and said "can I go to the backyard now?" It was 8 in the morning! Needless to say, kids are enjoying the summer and spending a lot of time outside - playing, running, biking. 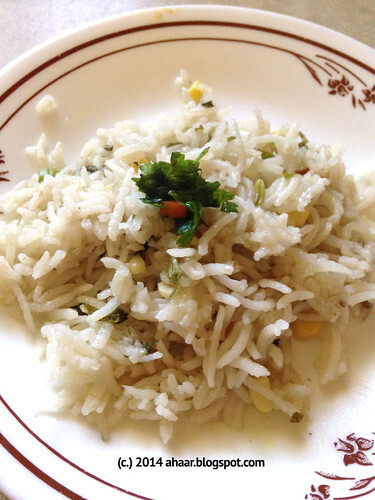 This mint and corn pulao captures the flavors of summer - fresh, light, and aromatic. There are probably many versions of mint pulao recipes. In this, I don't grind mint into a paste, rather it is chopped and rice is cooked with it. Result is a heady aroma of mint that is absorbed in each grain of rice. 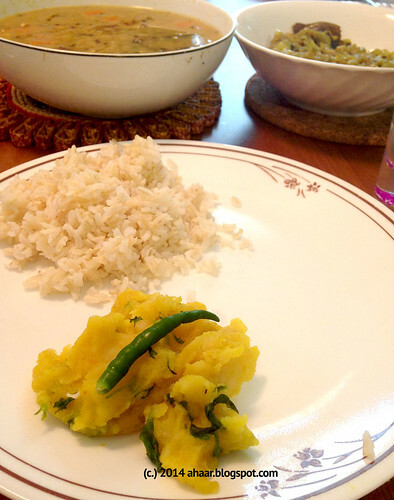 Sandeepa of BongMom Cookbook recently started A-Z of Bengali Cuisine. She is crowd sourcing the recipe suggestions for each letter. It's at letter C now. If you're not following, you're missing the fun. I recently commented on Beguni, and she asked me to join in. I couldn't resist, so here I am starting my own A-Z of Bengali cuisine. It may take some time to finish it but it will be a lot of fun to find a recipe for each letter. Shall we get started? Any Bengali will tell you, the first thing that comes to mind for A is aloo posto. I blogged about it many moons ago and over time have made variation to it adding other vegetables like okra, jhinge. Here is another one - aloo and zucchini posto. A is also for the various aamer chutney (raw mango chutney), and anarosher chutney (pineapple chutney). These light chutney or chaatni as Bengalis call it, is a light sweet, tart combination, rather watery with pieces of fruit. It's a perfect way to finish a meal. It is typically served at the end of the meal, but we love to add it as a side too. I have also served it with starters and crackers and is a good combination with some cheese. 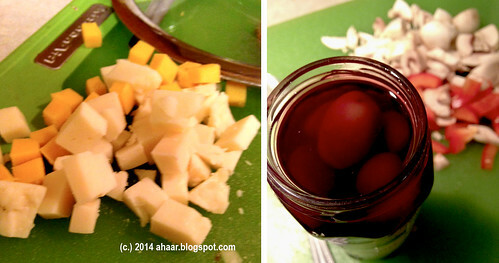 I recently made a big batch of anarosher chutney or pineapple chutney. The pineapples were leftovers from one of those multi-fruit platters. We got it for a get together recently. Kids polished of grapes, watermelons etc but the pineapples just sat there. We ate a few but it just sat there. This was the perfect time to make chutney. The chutney, one the other hand, was gone in a couple of days. We ate it with meals, on burgers, on crackers till it polished it off. If there is no fresh pineapple, use canned pineapples. You may have to reduce the cooking time for canned pineapples. I love the flowers that bloom in the front yard and backyard once spring hits. It daffodils and tulips (have a couple in the front yard and in the back yard), then come the lily of the valley. And just last week I felt the summer flowers are in full bloom now. In the backyard, currently, I have tree peonies and peonies blooming and honeysuckle tree is laden with flowers. So is rose bush that climbs over the fence with the neighbor. In front yard, it's roses and daisies. The rose I bought last year is full of flowers and it makes me so happy to see it when I come home. Tiny M was so intrigued by the peonies in the back yard that he would go and stand in front of it and keep tugging it. We have to constantly remind him "gentle, gentle." Lil A has no such interest in flowers. His favorite is still the veggie patch in the backyard. We recently harvested a good bunch of methi and am enjoying it a lot. Recipes from that in the next post. At night when the curtains are drawn and we are just reading or watching something, every now and then we get a whiff of the sweet smell from the flowers and it is just lovely. We have been watching "Orphan Black" on Amazon Prime. We are kind of hooked. It's mystery, sci-fi and little campy. What have you been watching/reading? I've said this before that I wait for my parents to come and get shrimp. It's not different this time. We got a nice pumpkin from Indian store and my dad made this chingri macher jhol with aloo and kumro (shrimp curry with potato and pumpkin). I really liked the sweet notes from the pumpkin along with the shrimp. One of my favorites now. Now that it is getting warmer, we are spending a lot of time outside. Little A is riding his tricycle (he needs a little help every now and then) and Tiny M is being pushed around in a hand me down Kettler with a handle. In fact, he want to it all the time. When we bring him back in the house, there are tears. Our favorite activity is to ride to the park, play, eat a snack and then ride back. What are you doing now that summer is here? My parents are here. Every time they visit, I wait for them to whip up a new dish. Last time it was kumro aar ucche (pumpkin and bitter gourd) chorchori, and before that it was shorshe begun (eggplant in mustard and peanut sauce). 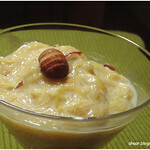 This year it is lau aar kumro ghanto (bottle gourd and pumpkin medley). 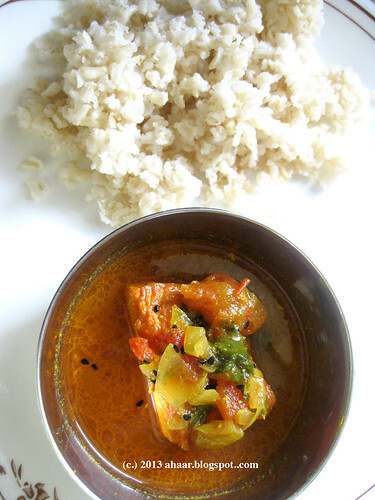 In this, the mild flavored vegetables are cooked in a bengali way (learn about ghanto way of preparing vegetables from Bong mom), with minimal spices and tastes fresh. 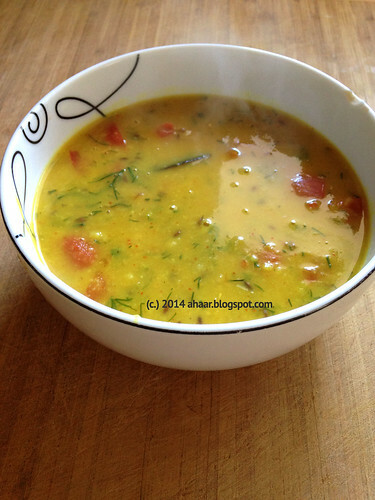 It serves as a perfect first course on a warm day with rice and dal or even sambar. I love a good tip. Whenever I see one about house, kitchen, or cooking, I bookmark it hoping to use it. Some get used immediately and some languish in bookmark folders for months and years before I find time. You remember the garlic tip from a few months ago. It has come in handy so many times since we learned it. Since then I have found a few more tips that have worked great for us. 1. My kitchen gets a lot of use, from baking veggies, fish, chicken and cake etc, we use it atleast a few times a week. But I haven't been very good about cleaning it partly because of sheer laziness and partly because of lack of a good cleaning product. A few weeks ago I found a tip in Kitchn about how to clean the oven with baking soda and vinegar. Without any chemicals? I immediately decided to act on it. I followed the step by step procedure and was very happy with the results. It did a great job removing most of the grime and there was no after smell. And clean oven is such a pleasure. 2. I saw this tip for making a border around the garden and thought this is what we need for the front patch of our house. It sat in my pinterest for the longest time. Now that the weather is nice and warm I reopened the link and decided to working on it. Instead of stone, we got bricks and it worked just as well. My father did the heavy lifting and it took us 3-4 days to get it in place. I am thrilled to have the new border and promptly celebrated by planing annuals. 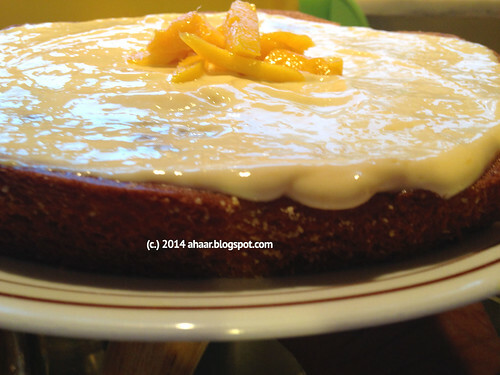 The recipe I want to share is mango cake. I made it on Mother's Day to celebrate my mom who baked cakes and custards in a small town in India when we were growing up. There was a small round tin box that was the oven and it came with a cake mould and some cupcake moulds too. I remember stirring the cake batter countless times as ma experimented with a recipe. The smell of cake cooking would keep us at edge and we would hang around till the cake was out and cut the still warm cake and pop it in our mouth. So for Mother's Day I decided to combine mango puree with almond flour and whole wheat flour and olive oil to whip out this cake before the day was over. I realized that I didn't have whipped cream so decided to make a greek yogurt topping and it was amazing. It was creamy and if you cool it for a few hours, no one can tell the difference. Make this cake and celebrate the little things that made you smile. We always have chutney powder at home. Sometimes homemade ones and sometimes store bought ones. From store we usually buy the MTR store one. Which ones do you prefer? 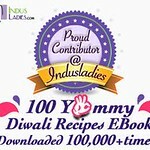 We use it for idlis, dosas, sometimes to spice up upmas or uttapams. Couple of weeks ago on Sunday, late afternoon, when the kids were taking a nap I wandered into the kitchen to make a cup of tea, I saw Aswin roasting almonds. I asked him what it was. He didn't tell me, instead he handed me an almond. With the spice and the saltiness and the crunch, I was intrigued by the spice mix. "What is it, it's great," I chimed. Chutney powder, he replied. Perfect combination. I mixed in some raisins (you can add cranberries or any other dried berries really) for sweet touch. The almonds were over with tea and immediately another batch was put in for the week. 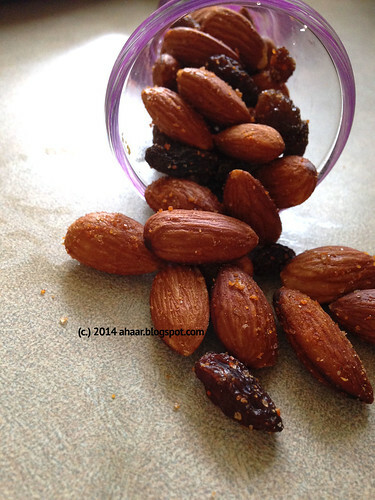 The almonds make for a great snack when the cravings hit. The same weekend, I added some chutney powder and fresh herbs in a cheese dip and that went well too. Sometimes weekends turn out to be fun trying out new things. Even better when the new things are a hit (I've had not so good moments too.) What about you? Shubho Nababarsha! Happy Bengali new year to my friends and readers. Hope you had a great start to the new year. I think I may be the last person to discover coffee grinder for Indian spices. I finally succumbed and bought one. The first thing I made with it? Shorshe macher jhol with a fine grind of mustard and little bit of posto. The ease of cooking. I am so glad to have discovered it and am now converting my parents into using it as well. Lil A's new favorite food is tacos. With shredded cheese, shredded cucumber, grilled fish, we've made various combinations and he loves it. We've even sent it to school with him. One evening last week, it was taco night for us. I made some shredded chicken for adult tacos and topped it up with manchego cheese. How have you adapted some of your kids favorite with yours? I am still boiling some dal and freezing for midweek use and was in a mood to spruce up the regular mooger dal. I had some dill leftover from the chicken rice and used it with tomatoes. The combination was just right. Dill was not overpowering, although be careful to use only leaves. The stem has a much stronger taste. I can't believe that it's been a year since we had the last playdate! After several cancelled plans (we both have little ones who keep us busy), we settled on a date in March. 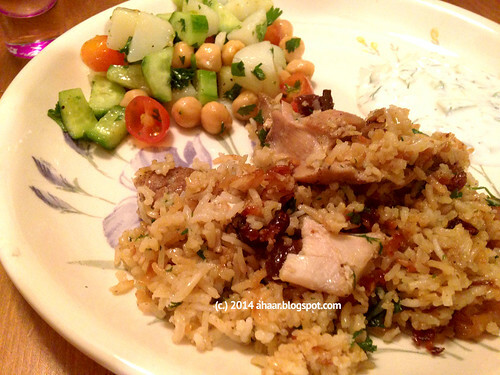 We looked through several recipes and decided on Yottam's chicken with cardamom rice. I had forgotten how much fun it is cooking with a friend. We settled easily into our routine - chopping, chatting, and sipping a glass of wine. The kids were absent for the first hour and it helped us prep most of the food for the evening. To go along with the rice, we had a chickpea salad, dill and cucumber raita, alphabet pasta for kids and lemon cookies for dessert. Once the kids arrived, it turned out to be a playdate for them too! They had fun making lemon cookies and then played together after dinner. It was a fun evening overall. We tweaked the recipe a bit adding some cumin powder, little bit of cayenne powder and adding juice of one lemon and then cooking the lemon with the rice. I added some whole cranberries and it worked well. The rice, ah! It was so delicious. Flavorful and fragrant, it is one of the best one-pot meal I've made and tasted in a while. The kids are beginning to play together. It is a lot of fun watching them chase each other or Tiny M laugh at Lil A's shenanigans. But there are also times when they want to play with the same toys and there is a lot of negotiation and 'taking turns' involved. Last week, we were at a friend's house who has a daughter about the same age as Tiny M. Most of the time she and Tiny M ignore each other. This time, however, they both were hanging out in the kitchen by the fridge playing with magnets and invariably wanted the same magnet. Suddenly Lil A appeared next to them, picked out a bunch of magnets gave it to Tiny M and said, "Here, these are your magnets." I was surprised by his possessiveness and protectiveness for his little brother. I had no idea. Reminded me of me with my little brother. Lil A has recently started eating paneer and so I am trying new recipes with it. I made paneer butter masala for a get together a few weeks back and it came out quite good, if I can say so myself. No cream in this, almonds give it a rich taste. 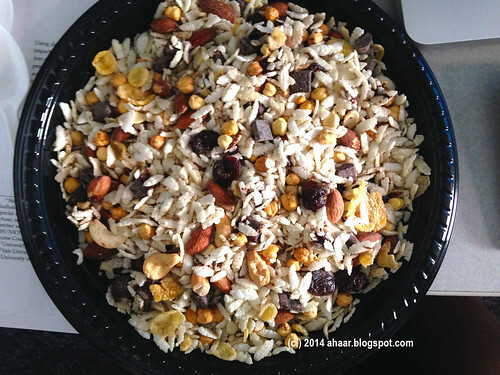 The raisins provide a hint of sweetness that goes well with paneer. I even took step by step pictures. But once it was made, I forgot to take the last picture and the paneer butter masala was gone soon. There are some things I get from Whole Foods (no one is paying me for this claim, it's just what I do), fish and meat being a few. They are one of the few places that carries smelt during spring, fresh from the lakes. I am also on a lookout for good salmon on sale whenever I go. If I find one, it is a prized possession because it makes for a creamy cooked fish. My go to recipe with it is baked and broiled with some spices and it makes a great dinner or lunch. I got one such salmon fillet when my parents were visiting last year. 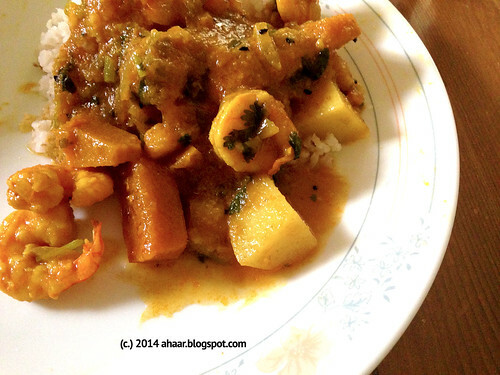 Usually, they make a kalia kind of curry with salmon because they find the smell strong. But this fish was so fresh that they decided to make a light jhol/curry which is usually reserved for freshest of fish. You can easily substitute salmon with any other fresh fish - tilapia or even small fish like smelt. With a little tomato and onion forming the base of the curry, this was a great lunch with some steamed brown rice. It's been a rough month with the family sharing cold, coughs and ear infections. While most of us have been managing it ok, it has been hard on Tiny M who has had multiple ear infections at the end of every cold. He goes to daycare full day and with it being so bitterly cold, the options for going out to play are few and far between. So sharing germs is easier on the baby floor where they all are probably chewing the same toy. I went through this with Lil A a couple of years ago, but feels like I don't remember now the waking up multiple times at night to soothe a cranky baby part. Somehow it feels new again going through it with Tiny M.
Do you feel that you have forgotten some of those baby days too? 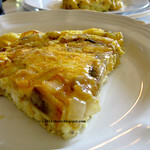 Another thing I have forgotten to do is get this recipe on my blog. We first made this salad for a friend's birthday party last October. It was a big hit and everyone asked us for the recipe. We promised to get it on the blog and then realized I didn't have any pictures. So I waited till the next time. And somehow, forgot again, and again. This time, I made a mental note and took pictures immediately. We've had the salad with pizza, scottish fish stew, kerala chicken stew and it goes well with everything. It also makes a great weekday lunch. I didn't even know what shakshuka meant till I opened Yottam Ottolenghi's book Plenty and found the recipe. Immediately, the picture arrested me. 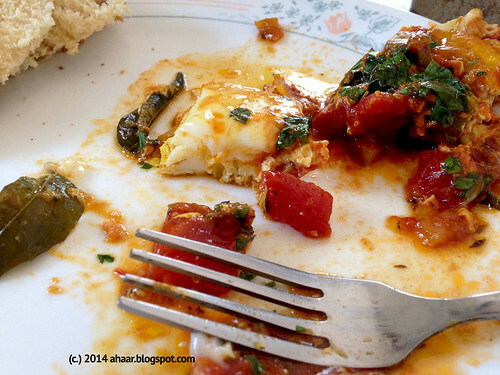 Of course we had to make it and once we did, shakshuka become a favorite in our house and among our friends. We've made it again and again tweaking it just a little every time, adding one vegetable, or a spice till it was perfect for sharing. Although there are several versions of this North African dish, the most common recipe involves eggs that are softly cooked in a hot skillet of spiced tomato and vegetable sauce. And the interesting combination of seasoning in which the eggs are cooked has stayed in our memory ever since we made it first. 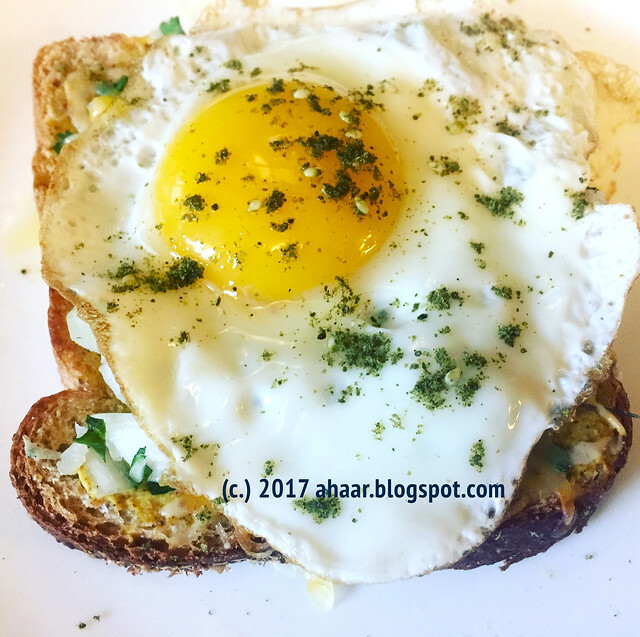 I mean, I had no idea that just adding saffron to the eggs would make such and interesting flavor! We've tweaked the original recipe from Yottam a little bit adding an Indian flavor to the North African dish and hope that it will become a favorite in your kitchen too.